Often referred to as ‘the Greatest Show on Earth’, the annual great wildebeest migration is undoubtedly one of nature's most spectacular wildlife events, showcasing all the main ingredients of the circle of life: birth, death and the survival of the fittest. Here we take you photographically, month-by-month through what you can expect during the great wildebeest migration. There’s a lot of movement from north to south during January. The wildebeest herds cover a huge area and can be found anywhere between Lobo and Naabi Hill, but they’re usually on the eastern side of the Serengeti at this stage. The first rains on the southern plains will trigger a quick move down to Ndutu. Female wildebeest are carrying calves and are ready to give birth as soon as it rains. February is calving season – a period when wildebeest, zebra and other migratory animals give birth to offspring. Wildebeest move very slowly and predictably during the month of March, as the newborn calves have to be fed. Expect a slow progression towards the west and north of Ndutu / Kusini Maswa (South Western Serengeti). April and May mark the start of the long, daily rains and the slow, but steady, movement of herds. Wildlife moves up the western side of the Serengeti, anywhere around Moru Kopjes / Lake Magadi (Central / Western Serengeti). Check out our page on the great migration in April & May for more information on what to expect and where you can stay to experience this leg of the migration. June is traditionally the Grumeti River crossing period, but this is mainly dependent on the water level of the Grumeti River. There is seldom enough water in the river to produce dramatic crossings. The catchment area is towards the Lobo / Klein’s area, so if it rains there during the month then you may just be lucky enough to see river crossings of the Grumeti into the Grumeti Reserves Concession. There is a distinct movement towards the north during July through the Grumeti Reserves up the western side of the Serengeti past Fort Ikoma. The first of the Mara River crossings take place later in July. It also signals the start of the mating season. For more information about the Mara River crossings and which lodges we recommend you experience this part of the great migration from, check out our July wildebeest migration page. August falls in the dry season and the Mara River crossings are now in full flow. 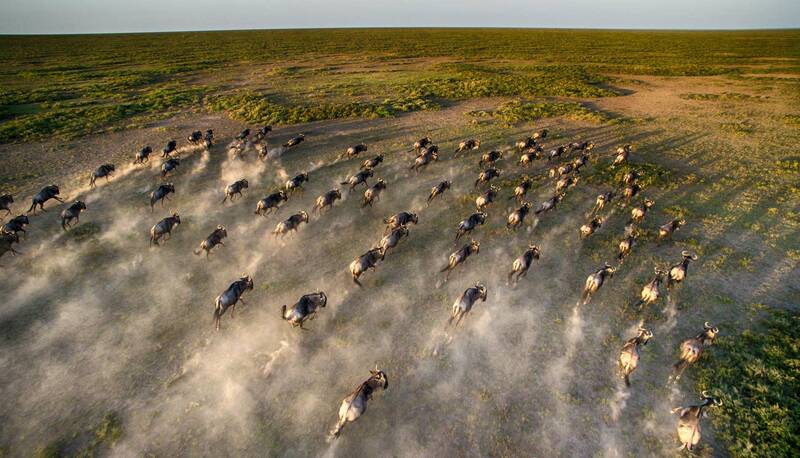 At this point, wildebeest herds cross the border from Tanzania (Serengeti) into Kenya (Masai Mara). August is a great month to view the breathtaking Mara River crossings. To see what else can be expected throughout the month, visit our page about the Great migration in August. Wildebeest herds have mostly crossed into the Masai Mara in September, and one can experience Mara River crossings back and forth continuously. Some of the wildlife will stay in the Greater Masai Mara area until all the lush green grass has been depleted. The wildebeest can move as far north as the private conservancies (Mara North, Olare Orok). The wildebeest herds start to cross back into the Serengeti and will move down slowly along the eastern side of the Serengeti / Loliondo areas. Want to know where the herds are? Our interactive map will show you exactly where the Great wildebeest migration is in October. In November the herds generally move back into the Serengeti completely and linger around Lobo, Mbuze Mawe and the Seronera Valley where there is a permanent source of water. November usually sees early rain that make the herds scatter into smaller family units all over the Central to Eastern Serengeti. For everything you’ll need to know about following the wildebeest into the Serengeti, check out our November great migration page. Waiting for the rain to come, the herds will move as far south as possible (water dependent) to be within reach of the southern plains in a few days. For wildebeest and other plains game taking part in this unique journey, the Great Migration simply starts all over again. The migration is a never-ending natural circle of life. 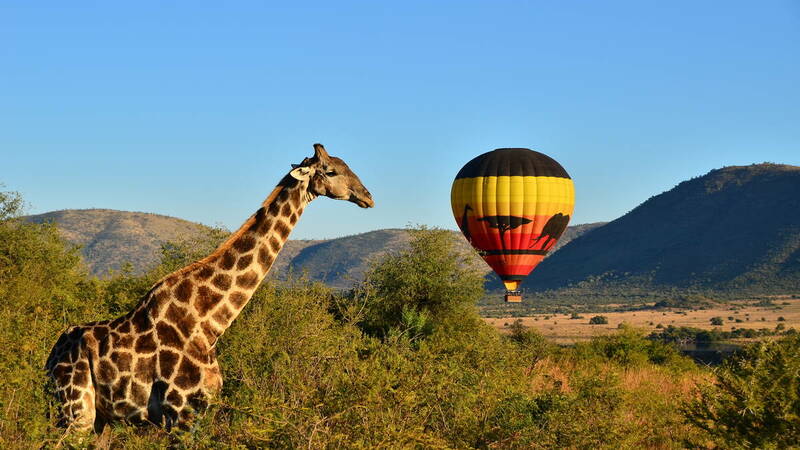 All the trials and tribulations that these wildlife go through make it a spectacular, one-of-a-kind game viewing experience. Catching some of the action should definitely make your bucket list!